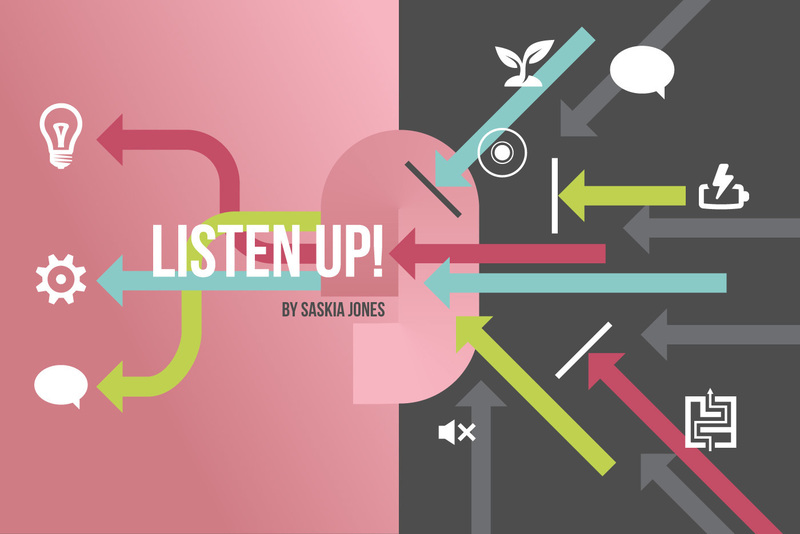 Award-winning internal communications expert Saskia Jones returns to the H&H blog with some handy tips to help you listen better to employees, so you can ensure that your internal comms campaigns really hit the mark. Do you feel you have your finger on the pulse in your organisation? Do you have mechanisms in place to gather employee feedback and gauge reaction to your internal communications? This isn’t just about monitoring page hits, number of downloads or number of attendees at an event. It’s about listening to what employees think and feel. Measurement can be daunting – a global survey by Poppulo revealed that for one in two internal communicators, measurement is the activity they spend the least amount of time on. 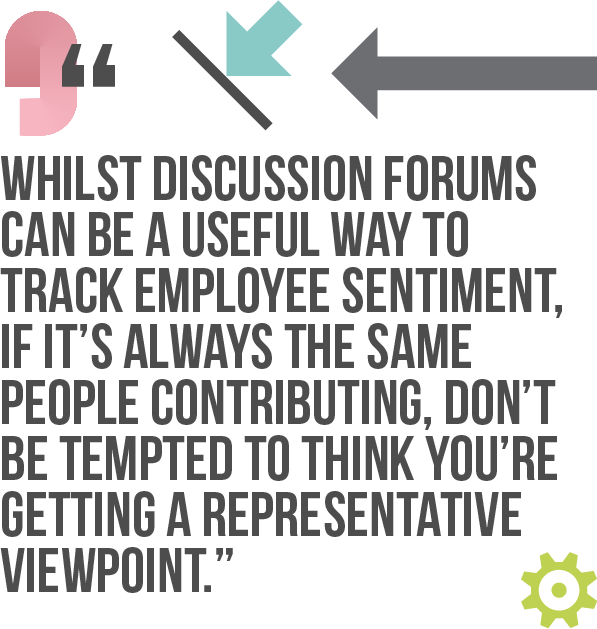 But what if you’re actually gathering employee feedback all the time without realising it? Below are 10 simple ways you can integrate listening into your ways of working. Many of them you’ll be doing already, some might be new. Put them all together and you’ll have your very own programme for listening to employees. Ensure every communication plan begins with what you know already, to shape your decisions. 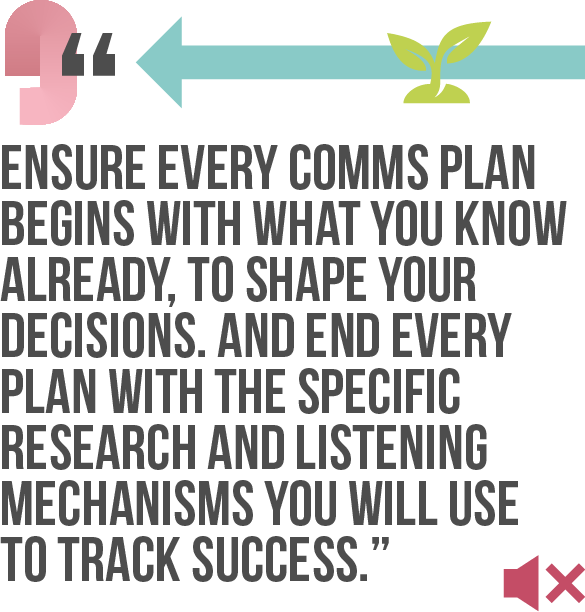 End every communication plan with the specific research and listening mechanisms you will use to track success. These contacts can be used as a sounding board and for ad hoc intelligence-gathering. Ensure they are across different teams and locations, not just within head office. Reach out to them in different ways – in person, on the phone and via your communications team. At the next opportunity, ask your leaders what they think of internal communications currently. Do they see any gaps? Is it adding value how they’d like it to? Which initiatives do they see as successful and why? Your focus within internal communications should align with your organisational strategic plan and what leaders think is currently most important. This might be a focus on cost-cutting, brand alignment or safety – whatever it is, ensure you are making an impact in this area. H&H have just developed a new free tool where you can quickly and easily create polls and see your answers in real-time. Check it out – it’s called Push. For longer surveys, there are a huge range of survey tools available, including SurveyMonkey and SurveyGizmo. 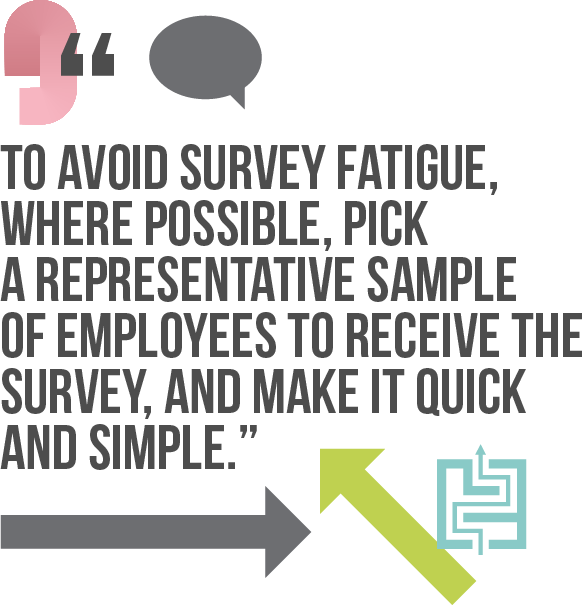 To avoid survey fatigue, where possible, pick a representative sample of employees to receive the survey, and make it quick and simple. The SurveyMonkey website has useful advice on how to structure questions and get the best response rates. You can either use these to complement your annual/pulse survey or to gather opinions on different initiatives and communications. From a new brand roll-out to the implementation of a change programme, focus groups provide an opportunity to get candid feedback. If budget allows, consider getting an external facilitator to run these, to help employees know they can speak freely and confidentially. 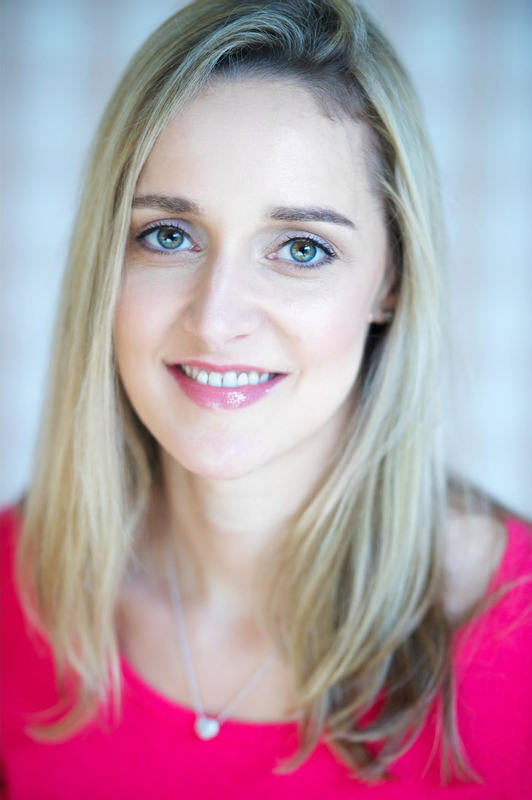 Use tools such as Yammer, SharePoint or Slack, to find out hot topics, areas of disgruntlement, and how employees are reacting to current organisational changes. Be aware – the space might be dominated by a few vocal employees. Whilst it can be a useful way to track sentiment, if it’s the same people regularly contributing, don’t be swayed to think that this is a representative viewpoint. Chat to people in the canteen, in the coffee queue or in the kitchen area. Make sure you visit different regional/country offices and stay in touch with remote workers. Don’t just stay for a meeting – spend time hot-desking in different locations to meet new colleagues. Save yourself time and effort by asking about research undertaken by other teams. You’ll often find that they’ve asked questions that can feed into your intelligence-gathering. For instance, HR will have details on sickness and absence levels, employee turnover and retention of ‘talent’. If you’re tracking morale, for example after a cost-cutting exercise or a major restructure, this kind of information will complement the results you are presenting, and paint a joined-up picture for leadership. 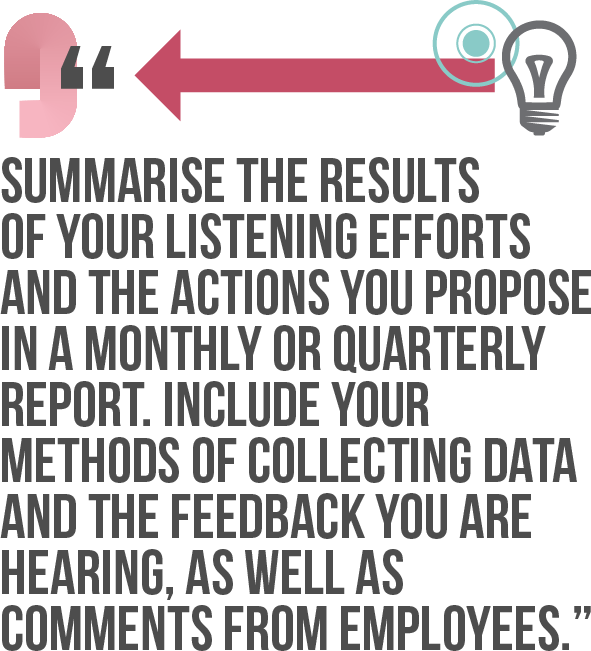 Summarise the results of your listening efforts and the actions that you propose in a monthly or quarterly report. Include your methods of collecting data and the feedback you are hearing, as well as verbatim (non-attributable) comments from employees to bring it to life. Crucially, share the next steps you propose, including how you might change your communication tactics as a result. Present results on how employees are thinking and feeling, and share data and suggested next steps. This will help leaders stay in tune with staff. Of course, if something pressing arises from your monitoring outside of these meeting times, you should share it immediately, along with your recommendations. Put these 10 tips into action and you’ll be able to refine your internal communications to best suit your audiences. You’ll be able to tackle people voicing ill-informed views on what employees are saying and thinking. Most importantly, you’ll be able to know what is working and what is not – and by being armed with data and evidence, you’ll command greater respect for you and your team. A key part of listening effectively to employees is engaging in conversations with them. 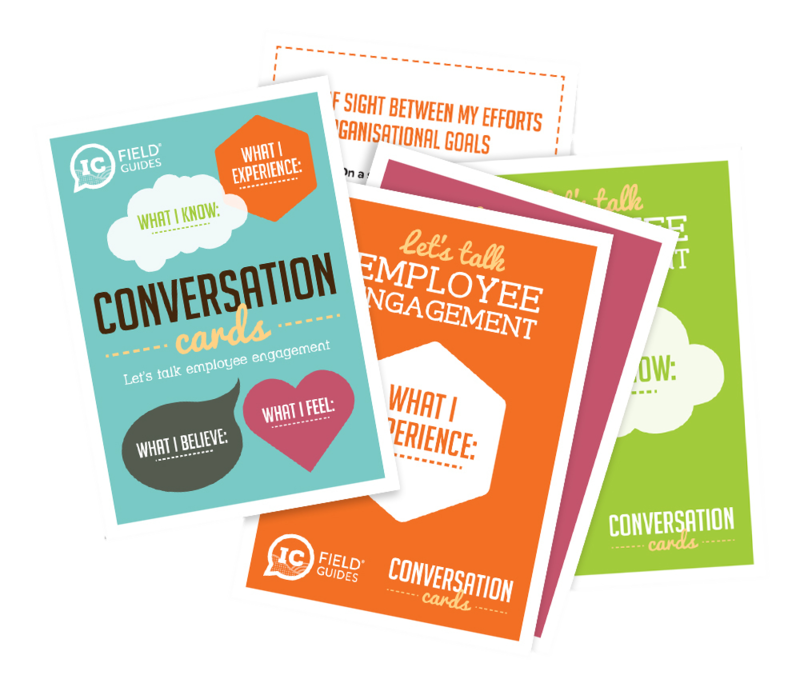 Download our free Conversation Cards pack for some handy pointers on getting the most out of your employee conversations – and uncover critical insights into Employee Engagement and productivity in your organisation. They’re your route to having illuminating and constructive conversations in the workplace!